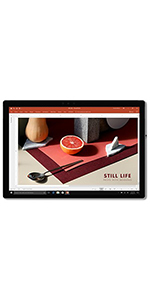 Buy Microsoft Surface Pro Intel Core-i5 7th Gen 12.3-inch Touchscreen Tablet (8GB/128GB SSD/Windows 10 Pro/Silver/0.770 kg), KJR-00001 @ 14% Discount. Inspiration can strike at any time and at any place. Reduce interruptions to your workflow with consistent internet connectivity when you’re on the move. The new Surface Pro with LTE Advanced delivers 4G LTE connectivity around the world with support of 20 LTE bands. Create, study, work and play virtually anywhere. Better than ever, ultra-light Surface Pro gives you total mobile productivity, all-day battery life1 plus a softer, ultra-portable design with rounded edges. Now available with LTE Advanced, for areas where there is unsecured, public, slow or no WiFi connectivity. Surface Pro delivers even more speed and performance, thanks to a powerful Intel Core processor — plus up to 50% longer battery life1 compared to Surface Pro 4 and fastest startup & resume feature of any Surface Pro yet. Surface Pro works perfectly with Surface Pen & Office and runs full Windows experience, including 3D creation tools. Enjoy fast, secured and password-free sign-in with the Windows Hello. Uncompromising mobility Create, study, work and play virtually anywhere. Better than ever, ultra-light Surface Pro gives you total mobile productivity, all-day battery life, plus a softer, ultra-portable design with rounded edges. Uncompromising mobility Create, study, work and play virtually anywhere. Better than ever, ultra-light Surface Pro gives you total mobile productivity, all-day battery life, plus a softer, ultra-portable design with rounded edges. 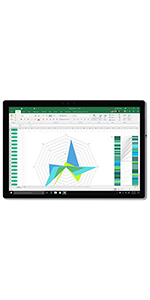 The best of Microsoft at your fingertips Surface Pro works perfectly with Surface Pen, Surface Dial and Office and runs the full Windows experience, including 3D creation tools. Enjoy fast, secured, password-free sign-in with Windows Hello. Make it your own Personalize Surface Pro and express yourself with next-generation creative tools in a choice of rich colors, including new Surface Arc Mouse, Surface Pro Signature Type Cover and Surface Pen — with real-time writing and new tilt for artistic shading — plus enjoy on-screen support for Surface Dial. Capacity: Intel Core i5, 8GB, 128GB | Style: Device Only Better than ever, the new Surface Pro is the most versatile laptop we’ve ever built. Completely redesigned from the inside out with all new custom parts, Surface Pro delivers more battery power, more performance and a superior display. 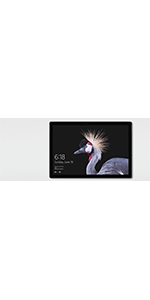 The stunning PixelSense display supports pen and touch, while the refined design provides 68% more battery life and 2.5X the performance of Surface Pro 3. A powerful Intel Core processor runs full desktop software with ease, ensuring a smooth, productive workflow. *Up to 13.5 hours for video playback. Testing conducted by Microsoft in April 2017 using preproduction Intel Core i5, 256GB, 8 GB RAM device. Testing consisted of full battery discharge during video playback. All settings were default except: Wi-Fi was associated with a network and Auto-Brightness disabled. Battery life varies significantly with settings, usage and other factors. 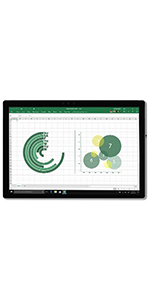 Best Cheap Deals For Microsoft Computer & Laptop, Grab Cheap Microsoft Surface Pro Intel Core-i5 7th Gen 12.3-inch Touchscreen Tablet (8GB/128GB SSD/Windows 10 Pro/Silver/0.770 kg), KJR-00001 Online.